Have you ever used grow lamps for your plants? If so, then you’ve probably been amazed by the effect of the light on the development of your plant. This article will tell you much more about the effects of light on plant development. As we will see, plant development really is something different from plant growth. We will explain the principles of light and its interaction with plants, and also give you some practical tips. Choosing the right lamp can make a huge difference to the quality and quantity of your crop. Everyone knows that a plant needs light to grow by means of photosynthesis, a process that involves energy fixation and sugar production. But in addition to providing energy, light also plays a key role in many other plant processes, such as photomorphogenesis and photoperiodism. All these processes are influenced by the light spectrum, which is the distribution of the light across the electromagnetic spectrum. In order to explain a plant’s different responses to light, we first need to think about the phenomenon of light itself. Light is a form of radiation, which takes the form of electromagnetic waves that pass through air or vacuums. It can therefore be described in terms of three physical properties: intensity (or amplitude), frequency (or wavelength) and direction of vibration (polarization). All possible forms of electromagnetic radiation can be described by placing them in the electromagnetic spectrum, see figure 1. When we describe the electromagnetic or light spectrum, it’s better to talk about wavelength than about color. That’s because visible light for humans comprises only a small portion of the light spectrum as a whole – namely the range of wavelengths between 400 and 700 nanometres (nm, which is 10-9 m). 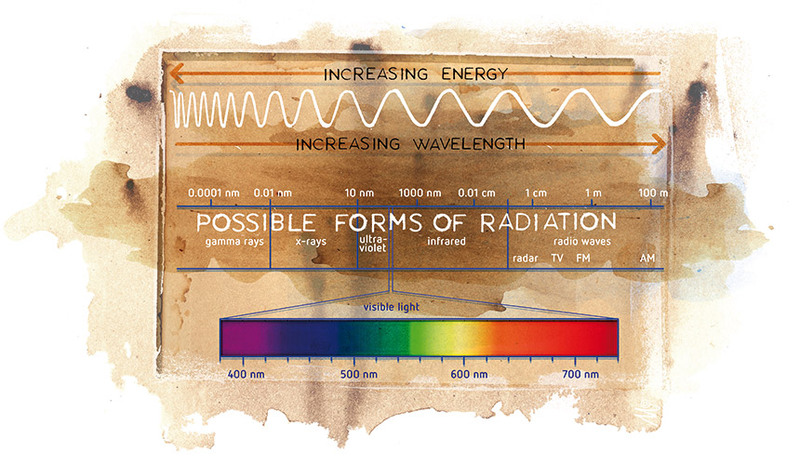 Figure 1: Light, in the form of electromagnetic waves, is described by the electromagnetic spectrum. The most important quality of light for plants is its wavelength or energy content; the shorter the wavelength the higher the energy content. As you can see from figure 1, this is a very small range. In fact, it is less than 1 percent of the total spectrum. Photosynthetically active radiation (PAR), or photosynthetic photon flux density (PPFD), is the range of light that can be used by plants to photosynthesise. However, because the PPFD is a summation of all photons in the 400-700nm range, two very different spectral distributions can have the same PPFD. This means that there is no one-to-one relationship between PPFD and spectral distribution. It also means that when we compare light sources, we need to consider spectral distribution data as well as PPFD. PPFD light is expressed as μmol/m2/s and tells us how many light photons will reach a predetermined surface area (m2) in a specified length of time (a second). To illustrate: most plants need a minimum of 30 – 50 μmol/m2/s PPFD to stay alive. As well as providing the energy for photosynthesis, light also acts as an information source for plants. Different light spectra give the plant an indication of its environment and therefore how it should survive, and hopefully thrive and reproduce. In this sense, the composition of the light is as important as the total quantity of light used for photosynthesis. 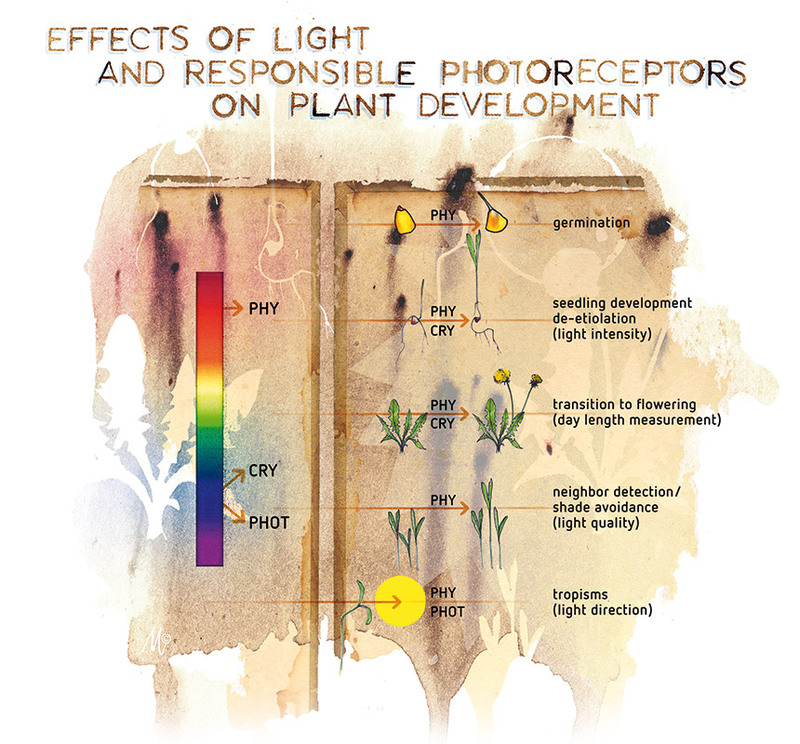 The light spectrum in the range of 300 to 800 nm causes a developmental response in the plant. Additionally, UV and infrared (IR) light are known to play a role in plant morphogenesis. A plant gains information from the light that reaches it by means of special pigments, called photoreceptors. These photoreceptors are sensitive to different wavelengths of the light spectrum. Figure 2: a plant gains information from light via three special photoreceptors: phototropins (phot), cryptochromes (cry) and phytochromes (phy). The first two are active in UV and blue light, while phytochromes respond to red and far-red light. The first two photoreceptors – phototropins and cryptochromes – are active in the lower range of wavelengths (UV (A) and blue). These two receptors obviously have different functions. Phototropins are responsible for phototropism or plant movement, and the movement of chloroplasts inside the cell in response to the quantity of light. Phototropins are what cause stems to bend towards light and stomata to open. Cryptochromes are pigments which sense the direction of the light. The inhibition of stem elongation is governed by cryptochromes as well as stomatal functioning, the synthesis of pigments and the tracking of the sun by the plants leaves. The other photoreceptors – phytochromes – are sensitive to red and far red light. There are two forms of phytochrome, Pfr and Pr, which interact. Phytochromes have the biggest influence on photomorphogenesis. Stem elongation, shade avoidance, chlorophyll synthesis and the flowering response are all functions typical controlled by phytochrome. See our article called ‘The effect of red and far-red light on flowering’, which will give you much more information about phytochromes. Now that we have looked at the light spectrum and the photoreceptors responsible for plant development, we come to the next question: how can we apply this knowledge as a grower? What makes a good light spectrum for growing? In order to answer this question, we need to think about the plant’s response to different light spectra. Because these fall mainly under visible light, we can speak about ‘colors’, starting with the most important ones for plant development. A larger proportion of blue light has an inhibitory effect on cell elongation, which leads to shorter stems and thicker leaves. Conversely, a decrease in the amount of blue light will cause a larger leaf surface area and longer stems. Too little blue light will negatively affect the development of plants. Many plants need a minimum amount of blue light, which ranges from 5 to 30 μmol/m2/s for lettuce and peppers to 30 μmol/m2/s for soybean. Because red and far-red light have a higher wavelength, they are less energetic than blue light. Combined with the profound influence of the red-induced phytochromes on plant morphogenesis, relatively more red and far-red light is needed for plants to develop. The two forms of phytochrome, Pfr and Pr, play an important part in this process. Because red and far-red light are both present in sunlight, plants in nature will almost always contain both Pfr and Pr phytochromes. A plant senses its environment by the ratio between those two forms; this is called the phytochrome photostationary state (PSS). The Pr phytochrome has a light absorption peak at a wavelength of 670 nm. When the Pr absorbs red light, it is converted to the Pfr form. The Pfr form acts the other way around – when it absorbs far red light at a peak of 730 nm, it converts into a Pr form. 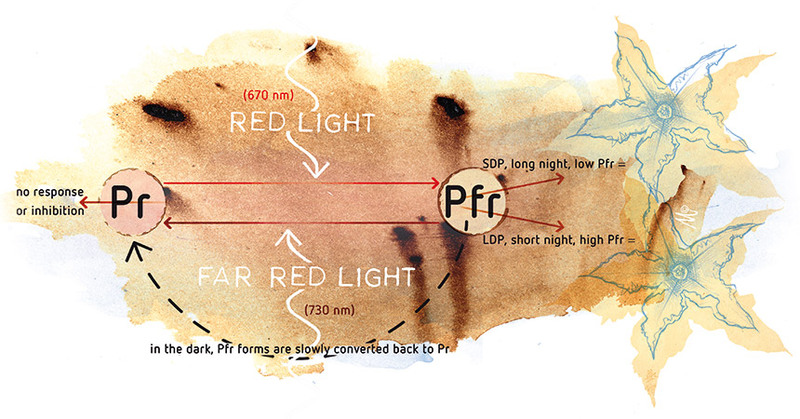 However, because Pfr molecules can also absorb red light, some of the Pfr molecules are converted back to Pr. Because of this phenomenon, there is not a linear relationship between PSS and the ratio of red to far red. For example, when the ratio of red to far red light exceeds two, there is barely any response in the PSS and thus plant development is not affected. It is therefore better to speak about PSS than the red to far red ratio of the light. The amount of Pr and Pfr tells a plant which light it is receiving. When there is a lot of Pr present, this means that the plant is receiving more far red light than red light. When there is less red light, the opposite conversion (from Pr to Pfr) is hampered, meaning that there is relatively more Pr. Figure 3: Since far-red light is mostly reflected by the surface of the leaves, a plant receives (relatively) more of this light when it is crowded in with neighbouring plants. In order to avoid the shade, a plant grows longer stems so that it can catch more light. In environments in which many plants grow close together, all the red light from the sun is used for the photosynthesis process (between 400 and 700 nm) and much of the far red light is reflected by the plants (>700 nm). Most of the plants, especially those in the shade, will receive more far red than red light in this situation. As a consequence, Pr increases, and when this happens, the plant senses that it needs more light for photosynthesis and stem elongation is triggered (see figure 3). The result is taller plants with a bigger distance between the internodes and a thinner stem. 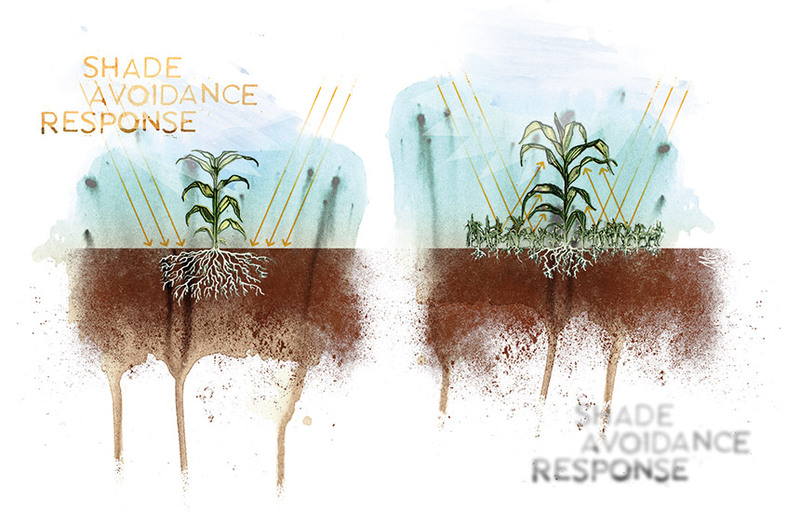 This is a clear example of a shade avoidance response, where plants seek to capture, more light in order to survive. Taller plants can absorb more red light which increases the quantity of Pfr forms. This will trigger greater branching, shorter distances between the internodes and less vertical growth in order to maximize the light absorption for the photosynthesis. As a result, plants expend less energy on growing as tall as possible and allocate more resources to producing seeds and expanding their root systems. Flowering is also influenced by the Pr and Pfr forms. The length of time for which Pfr is the predominant phytochrome is what causes the plant to flower. Basically, the levels of Pfr tell the plant how long the night is (photoperiodism). As the sun sets, the amount of far red light exceeds the amount of red light. During the darkness of the night, the Pfr forms are slowly converted back to Pr. A long night means that there is more time for this conversion to happen. Consequently at the end of the night period, the concentration of Pfr is low and this will trigger short-day plants to flower (see figure 4). A low red to far-red ratio and consequently a limited amount of red light at the beginning of the night is thus very important for the flowering of short-day plants. Research conducted on three short-day plants – chrysanthemum, dahlia and African marigold – shows that when the night is interrupted by a red flash, causing a high red to far-red ratio, flowering decreased dramatically. It was also concluded that far red light alone does not regulate flowering. An equal or higher far-red light portion will improve flowering for short-day plants. Figure 4: The interaction between the Pr and Pfr forms and its effect on flowering in short-day plants (SDP) and long-day plants (LDP). It’s often assumed that only blue and red light help plants to grow and develop but that’s not completely true. Although much of the green light is reflected back off the plant’s surface (that’s why we humans see plants green), green light itself can also be beneficial for a plant. The combination of different light colors can lead to higher photosynthesis than the sum of its parts. Research conducted on lettuce also shows that plant growth and biomass increased when 24% green light was added to a red-blue LED, while maintaining equal PAR levels (150 μmol/m2/s) between the two objects. This indicates that even green light can have a positive influence on plant growth. Ultraviolet (UV) light has an effect on plants, too, causing compact growth with short internodes and small, thick leaves. However, too much UV light is harmful for plants, since it negatively affects the DNA and membranes of the plant. Photosynthesis can be hampered by too much UV light. Research shows that this happens at UV-values higher than 4 kJ/m2/day. The next step is to provide the best light spectrum for your situation. If sunlight is not sufficient, this can be done by selecting a good grow lamp. The emergence of light-emitting diodes (LEDs) in plant production, which you can read more about in our other article, makes it easier than ever before for growers to optimize the light spectrum. Grower’s Tip: Need a Light?